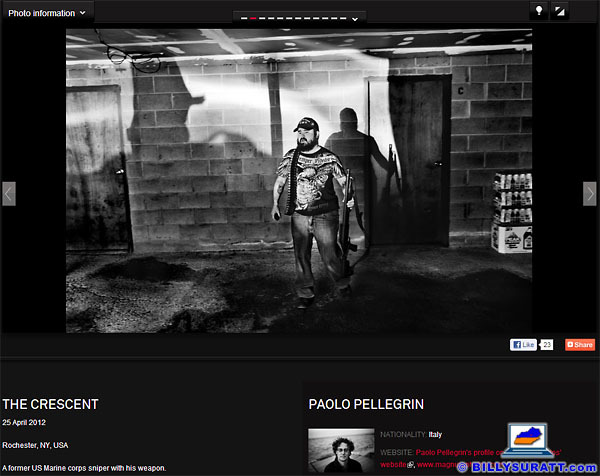 BagNewsNotes published a piece Friday calling into question the ethics of Magnum photographer Paolo Pellegrin. Troubling questions have arisen concerning the veracity of a photo contained in Pellegrin’s picture story, “The Crescent,” which won second place in the general news category of the 56th World Press Photo Contest on Feb. 15 and was part of a portfolio of images notching Pellegrin freelance/agency Photographer of the Year honors in the 70th Pictures of the Year International competition Feb. 17. Photo District News described the Italian photographer’s award-winning POYi portfolio as “a study in the type of photography for which Pellegrin is well-known: unflinching reportage combined with layered, poetic images that blur the lines between documentary and art.” In this case, however, Pellegrin’s work also blurs another significant line: the one between truth and fiction. What’s wrong with this picture, literally? A lot of things. It’s a posed portrait, but the viewer might reasonably infer it’s a candid documentary photograph. Neither the posing nor presented caption gives a reasonable viewer any indication this image is a portrait. The subject of the photo, Shane Keller, was a photojournalism student at RIT when the picture was made. Keller lived in the Rochester suburbs, miles away from even the loosest geographic definition of the city’s “Crescent” area. Keller formerly served as a Marine Corps combat photographer, not a sniper. Military photographers are typically non-combatants and calling one “a sniper” is like saying whoever processes the SEAL Team 6 payroll at Navy human resources command was part of the team that killed Osama bin Laden. The truth as I see the Paolo Pellegrin saga, is that he posed a photo of a gun-toting white guy wearing a baseball hat, (a truly American cliché), to make his story on The Crescent in Rochester more relevant. It was also shot miles from the area. He is obfuscating about his use of a photo that is out of context with his essay, employing a Lance Armstrong type of defense, (i.e. shoot the messenger bearing the news, BagNews, and anyone else riding their, “journalistic high horse,” who dare criticize him). He also used verbatim an old story from the NY Times, no attribution, as the underlying text of his photomontage, a cardinal sin, and has blamed others for that. Contest entries are submitted under your name, and you are solely responsible for their content. Period. It’s not your assistant who is getting the award. We photographers are at a crisis point of credibility, and the Pellegrin matter is exacerbating the problem. Something has to be done to help right a listing ship. Reuters, AP, AFP, Getty, and other news publications have zero tolerance for this, and maintain that essential and hard line on professional ethics. The people who run the Pictures of the Year International, (POYi), and the World Press Photo contest need to do the same. They need to make a gutsy call now to fairly review this problem. If their judgment is that the awards given to Mr. Pellegin for his contest entries appear to be tainted, then those awards have to be withdrawn immediately. Kennerly is among the most high-profile critics of Pellegrin’s shenanigans. While some photographers and photo editors have dismissed the matter as “annual awards envy,” Kennerly’s right to level criticism here is above reproach. Pellegrin’s photo is a lie, his caption is a lie and, if that weren’t bad enough, it appears he even plagiarized caption material from a decade-old New York Times article. Others have rallied to Pellegrin’s defense, seemingly finding BagNewsNotes’ failure to contact the Magnum photographer to get his side of the story before publishing more egregious than Pellegrin’s ethical transgressions. “I just wanted to write on behalf of Paolo Pellegrin whose work is being questioned currently on this and in other venues. Remember there are always 2 sides to a story. Read both on various blogs,” National Geographic contributor Maggie Steber wrote on her public Facebook profile. “But as someone who knows Paolo, I just have to say that I believe in him, I find him to be a man of integrity, an excellent and intellectual photographer, someone I love and admire, and someone whose whole body of work — his oeuvre as the French would say — is one of the most fluid, beautiful, shocking, intellectual, powerful bodies of work I have ever seen,” Steber wrote. While it would have been nice if BagNewsNotes had contacted Pellegrin, I don’t personally have a problem with it. We’re talking about a blog here, not a traditional publication; the fact the reporting is one-sided isn’t nearly as important to me as the fact the reporting is accurate and fair. In my opinion, it is. “Paolo wanted someone to illustrate his own thoughts about Rochester, NY, and and rather lazily used this young man, who was a former student to create an image that would have the impact that he wanted. He then sandbagged him by posing him in an ominous looking part of the house. The result is the young man’s face and name published in a context that was completely out of character. ….Had Pellegrin been working with a reporter as we did at Life, like Ed Barnes, there is no way this photograph ever gets past the editors, or even on their desk,” Levin said. Bottom line: shame on Pellegrin, shame on Magnum, shame on World Press Photo and shame on POYi. If lying with your camera, grossly misrepresenting your subject and plagiarizing others’ work is what it takes to be an “award-winning photographer” nowadays, I’ll wear my 0-for-whatever record in major contests as a badge of honor. I’ll also be in good company.